Since I'll be away for a year in South Korea shortly, and since my younger brother Luke has been hiding up in La Crosse all year, I drove up on Monday evening to visit him. On Monday we went to trivia night at The Root Note. Even though he plays with the 3rd Relation Jazz Quintet at The Root Note every Tuesday evening, I had never been to this cafe before. It was so neat inside! 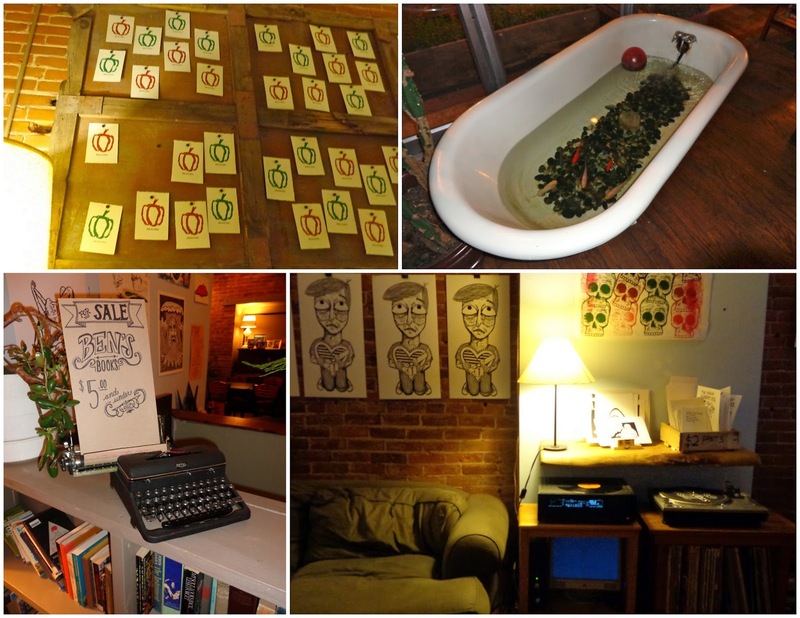 There was lots of art work on display, a bathtub fish tank, a typewriter, and books & prints for sale. We got fifth place, which wasn't so bad. And we learned that Superbowl L will take place in 2016! 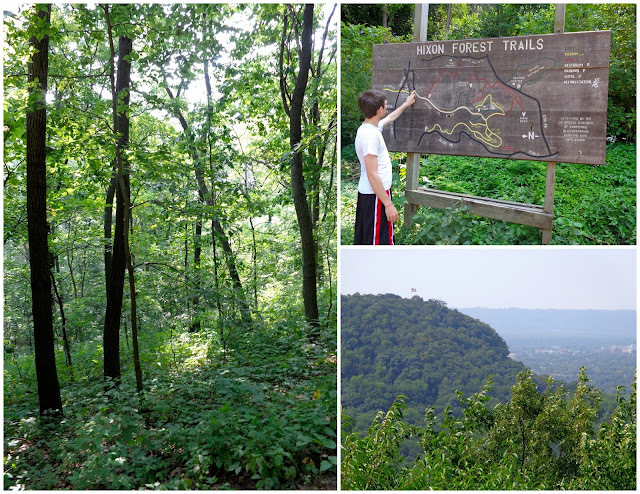 On Tuesday we went for a hike in the bluffs on the Hixon Forest Trails. The trail Luke has taken before was closed, so we took another path until we found a way to go up. At one point during the hike, Luke nearly fell off a steep rock. I found him holding on to the edge of this rock for his dear life, so I took a photograph (below, left). 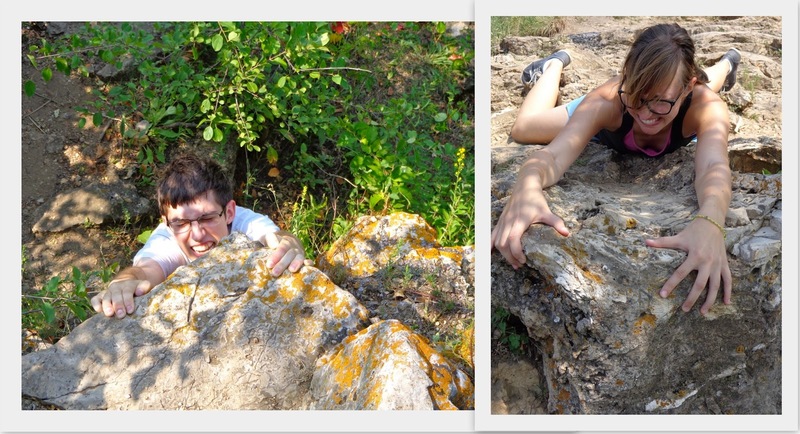 Believe it or not, I climbed up the side of a rocky cliff, using my powerfully strong arms to pull myself up. 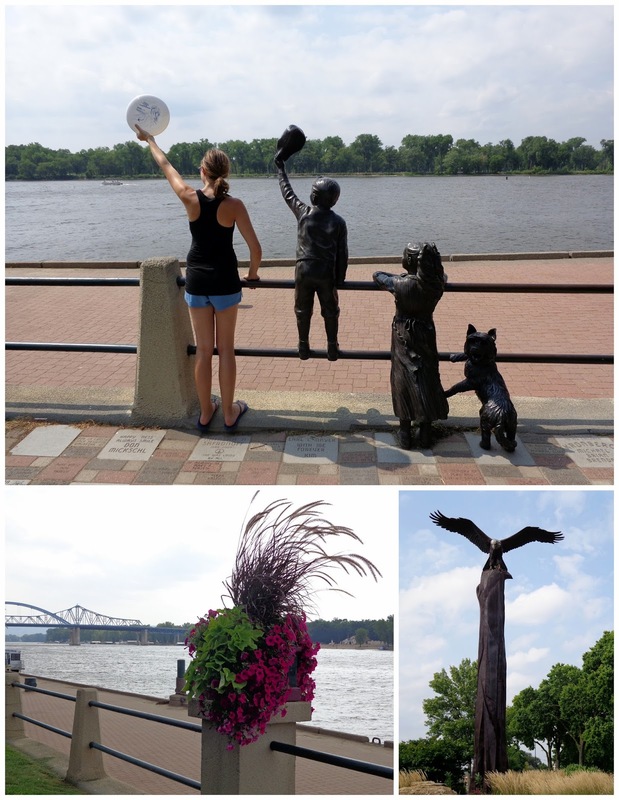 This was also documented by photograph (below, right), as Luke knew I could pull myself up at the top without any of his help, so he was free to take pictures. 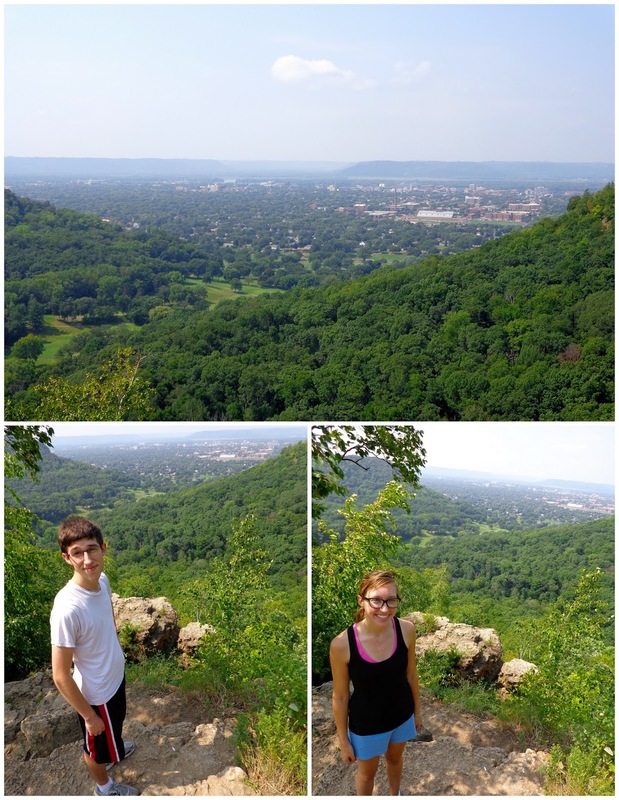 We ate lunch at the bluffs once we hiked back down to ground level. Then we drove back to Luke's house to grab books and more water, before walking to the river for a bit. We both read and snoozed in the grass -- it was perfect weather for naps in the park. That night Luke's jazz quintet (now a quartet, since the trumpet player moved away) played at The Root Note from 8-11, as they do every Tuesday (check them out sometime!). It was fun to meet everyone in the quartet, as well as Luke's friends in the audience. I liked that in the second half of their gig, the quartet invited musical audience members to come up and play or sing with them. One guy came up and sang an amazing My Funny Valentine. Another man came up and played drum set for a few pieces. 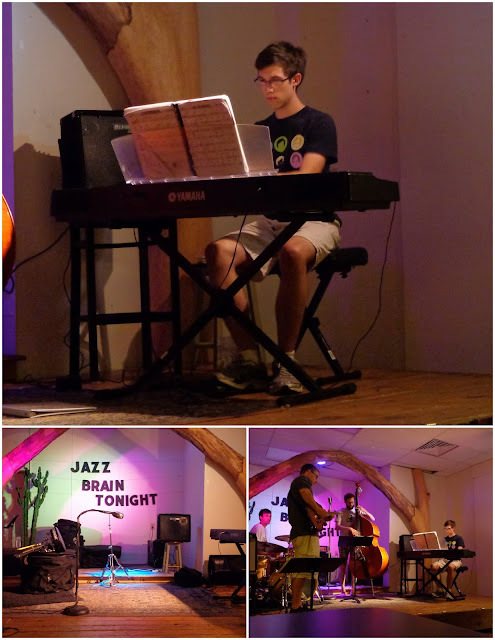 A friend played bass for a song or two, and there was an energetic trumpeter who snuck in for a few songs as well. Thanks for a great start to the week, hermano! I know, I know -- I just barely see you even when I live in Madison, so it feels like you're hiding away! you two are pretty great! Aw thanks -- I think you're pretty great, Root Note!